On a particular Sunday, one of the other nursery leaders brought in all the fixings for a "Petit Bonhomme". 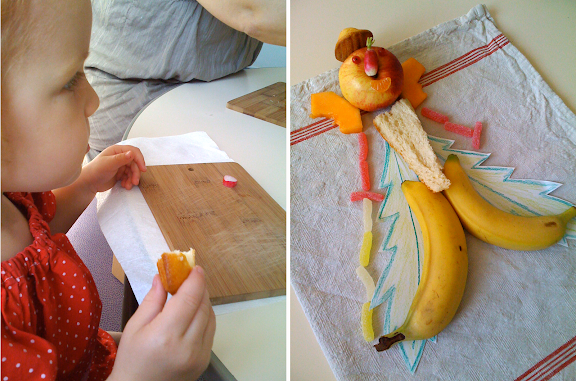 While she sang this song she cut up fruit, vegetables and everything else and in the end created a delicious masterpiece. Isn't it darling? So sweet. And I understand completely the feeling of relief having to speak French in front of just a few people. Wow, that is so adorable. So lovely, it reminds me of Japenese bento boxes. I adore sending my kids with their bento boxes to school. I have never looked at food the same way since getting our boxes!